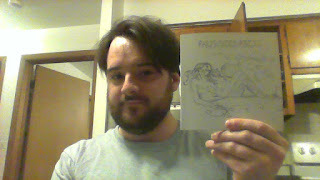 I got my copy of the Retrospective zine from Palm Sized Press! It features one of my stories as well pieces from close to a dozen other authors all in a booklet the size of a cd cover! Remember those things? The maggot’s existence began as abruptly as any other organism’s tenure on earth. The slimy, milky white infant writhed with its brethren embedded in the decomposing human flesh. Only when the body is human is it called a corpse, but the maggot holds no such concept as sanctity and simply eats the remains breaking down the biological shell that once held and animated every intangible aspect of a human being into its most basic organic components. Like the imperceptible scavengers nurturing themselves by the billions in the rot, the maggot was born from atrophy's terminal cycle. A single complex entity was dissolving and distributing its energies among an inconceivable variety of far simpler life forms like the eyeless maggot at the early stages of a process that inevitably will end the same as its host. A maggot is small and so is its view of the world. It can never know its place in the process of existence, an existence that arranges itself and emerges like waves being stirred in the eternal sea of entropy. The maggot does not even have the whole view of what it's eating until it emerges from the decomposed heap as a fly and can look down on its putrefied cradle. Only then does it have the point of perspective to know it and the corpse, the discarded vessels of life are one in the same.